Looking for a car? Looking for a car that’s down to clown? Looking for a car that’s active and speedy and keen on engaging in vigorous driving maneuvers? 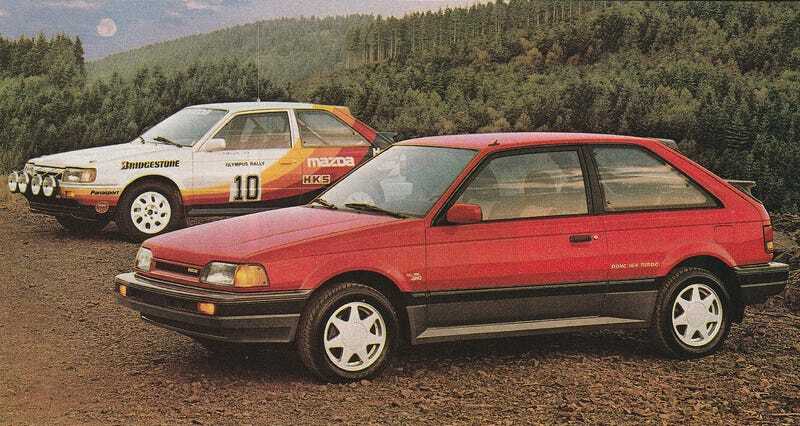 Well, good friends, direct your eyes to the sweet cherry that is the Mazda 323 GTX. The Mazda 323 GTX is a peach. It is a dollop of cream. It is a cool drink of water on a hot day. It is a 2,645-pound car, with a turbocharged, intercooled, fuel-injected, 16-valve four-cylinder 132-horsepower B6T engine, a five-speed manual transmission and all-wheel drive. Each and every wheel is driven. The front ones. The back ones. All of those wheels. In that all-wheel drive system was a lockable center differential, lockable with a switch on the dashboard. Neat! But there’s more to this car than specs. There is true spirit and verve in this car, one of the great Group A rally cars, debuting as a homologation special in 1986 just as the killer Group B was coming to a close. Watch Formula Drift’s Chelsea DeNofa wind the devil out of the car, sliding it, off-roading it, and mountain climbing in it, just a cheap car he bought because he didn’t want his dog’s dog hair getting in any of his other vehicles. As you can see, the GTX gives more than it needs to. It has inner vigor, bursting free.